Home FAQs What is the polluter pays principle? The ‘polluter pays’ principle is the commonly accepted practice that those who produce pollution should bear the costs of managing it to prevent damage to human health or the environment. For instance, a factory that produces a potentially poisonous substance as a by-product of its activities is usually held responsible for its safe disposal. The polluter pays principle is part of a set of broader principles to guide sustainable development worldwide (formally known as the 1992 Rio Declaration). This principle underpins most of the regulation of pollution affecting land, water and air. Pollution is defined in UK law as contamination of the land, water or air by harmful or potentially harmful substances. Why should the principle be applied to greenhouse gas emissions? Greenhouse gas emissions are considered a form of pollution because they cause potential harm and damage through impacts on the climate, and also contribute to air pollution that the World Health Organisationestimates causes almost 12% of global deaths in 2012. 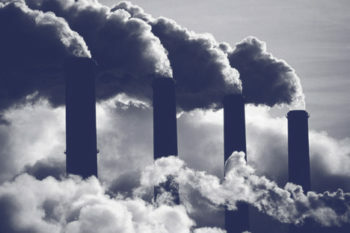 But because society has been slow to recognise the link between how human activities have increased the rates of greenhouse gases emissions that can cause the climate to change, emitters are generally not held responsible for controlling this form of pollution. When the pollution cost from the release of greenhouse gases is not imposed on emitters, these costs are thus ‘externalised’ to society, representing what economists describe as a ‘market failure’. Society bears these costs as greenhouse gases are emitted into the atmosphere, which is described a ‘global commons’ as everyone shares and has the right to use. The polluter pays principle can be applied to greenhouse gas emitters through a so-called carbon price. This imposes a charge on the emission of greenhouse gases equivalent to the corresponding potential cost caused through future climate change – thus forcing emitters to internalise the cost of pollution. In this way, a financial incentive is created for a factory, for instance, to minimise its pollution costs by reducing emissions. The carbon price can make the polluter pay through two different policy instruments. The first is a straightforward price-based mechanism in the form of a carbon tax, where the price of pollution is determined by the rate of the tax for each tonne of greenhouse gas emitted. The second form is through a quota-based system, often referred to as a cap-and-trade, or emissions trading system. This sets a cap, or limit, on the maximum level of emissions for a given time period, and distributes permits or allowances for each unit of greenhouse gas among firms that produce emissions. Some firms find it easier or cheaper to reduce emissions than others, and can thus sell permits to firms whose cost for reducing emissions is much higher. Therefore the trading takes place between high-cost and low-cost polluters, thereby determining the price of a polluting permit. The polluters have ‘paid’ through ensuring they have enough permits to cover the amount of emissions they have emitted for the given year. Could a uniform carbon price be effective? Regardless of which type of instrument is used, many economists argue a carbon price should be global and uniform across countries and sectors so that polluters do not simply move operations to so-called ‘pollution havens’ – countries where a lack of environmental regulation enables them to continue to pollute without restrictions. TheReport of the High-Level Commission on Carbon Prices(2017) estimated that the appropriate carbon price across the world will need to be US$40–80/tCO2e by 2020, and US$50–100/tCO2e by 2030, to be consistent with meeting the goals of the Paris Agreement. For jurisdictions that use a carbon tax, this would require directly setting the rate at the appropriate carbon price. However, this has often been politically difficult to impose. For jurisdictions that have an emissions trading system, a tighter cap can be imposed to restrict the supply of permits, and thus indirectly increase the carbon price to a level that is in line with the Paris Agreement. This FAQ was updated in May 2018. The original FAQ was reproduced from the following article: What is the polluter pays principle? © The Guardian, 2012, used under a Creative Commons No Derivative Works licence.